Shane McGuigan was the scoring star for St Mary's while Jack Savage hit 0-8 for IT Tralee. IT TRALEE FINISHED with just 12 players as Shane McGuigan scored 10 points for 2017 Electric Ireland Sigerson Cup champions St Mary’s who advanced to a quarter-final meeting against Maynooth after today’s win in west Belfast. Kerry forward Dara Moynihan was sent off for a second yellow card offence with 10 minutes to go, and that was followed by black cards in the dying minutes for Brian Fitzgerald and DJ Murphy. That wasn’t the end of the bad news for Kerry fans – Tralee skipper and Kerry defender Gavin Crowley hobbled off after just 10 minutes with a dead leg and is a major doubt for Kerry’s Allianz League game away to Cavan on Sunday. Nine of McGuigan’s points came from frees, the Slaughtneil man only missing one placed ball all after afternoon at the St Teresa’s pitch. Tralee’s Jack Savage nearly matched him with 0-8 from frees. The visitors scored four points in a row before half-time to creep ahead at 1-6 to 1-5 at the break. After Gavin Crowley’s superb point with the outside of his right boot from long range, Conor Keane increased Tralee’s lead when he rounded the ‘keeper and blasted the ball into the roof of the net. St Mary’s replied almost immediately. Although Tralee midfielder Liam Kearney started well in the first 10 minutes, St Mary’s completely took over in this sector with Jarlath Óg Burns superb. His run down the left flank set up their goal, with McGuigan involved and Stephen McConville’s fist pass across to the back post palmed into the net by Derry man Niall Toner. The third quarter was even enough and it was all level at 1-10 apiece with five minutes remaining. Tralee were aggrieved at some of referee Martin McNally’s decisions in the final quarter and McGuigan punished almost every free given St Mary’s way. St Mary’s were a point up when Moynihan was dismissed with 10 minutes to go and were three up when Fitzgerald picked up a black card in the last minute of normal time. Murphy joined him in the sin-bin in one of the last plays of the game. Scorers for St Mary’s: Shane McGuigan 0-10 (0-9f), Niall Toner 1-0, Tiernan Sludden 0-2, Aaron Duffy, Jarlath Óg Burns, Ryan Coleman 0-1 each. Scorers for IT Tralee: Jack Savage 0-8 (0-8f), Conor Keane 1-0, Gavin Crowley, Dara Moynihan 0-1 each. In this afternoon’s other Round 3 tie, last year’s Sigerson Cup finalists NUI Galway won out by 0-11 to 0-9 in Templemore against Garda College. They were in front 0-7 to 0-4 at half-time and held on in the second half for victory with Galway senior Peter Cooke kicking some vital points. NUI Galway will now take on Jordanstown at the quarter-final stage next Tuesday with St Mary’s facing Maynooth University. The remainder of the quarter-finals will be finalised tonight. Meanwhile in the Fitzgibbon Cup today, Limerick IT ran out 3-21 to 0-8 victors over Trinity College to book their spot in next week’s quarter-final ties. 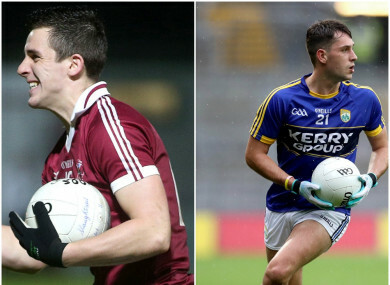 Email “0-10 for Derry's McGuigan in Sigerson win for St Mary's as Tralee finish with 12 men”. Feedback on “0-10 for Derry's McGuigan in Sigerson win for St Mary's as Tralee finish with 12 men”.